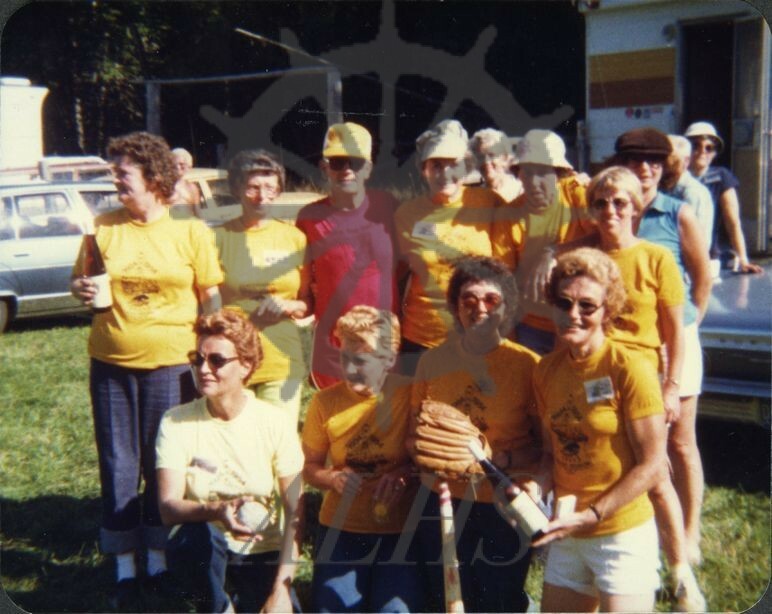 Group of attendees pose for camera, Nakusp Grand School Reunion, Legion Park (now McDonald Creek Provincial Park), 2 August 1981. TOP (l-r): Rosie Robson (nee Rosie Wanstall), Helen Nixon (nee Helen Juras), Cam Hood, Mavis Meikle (nee Mavis Barlow), Dorothy Cowan (nee Dorothy Evans), Doreen Desrochers (nee Doreen Parent), June Simard (nee June Gardner). BOT: Sonja Dolman, Laura Beingessner (nee Laura Robson), Ruby Kerr (nee Ruby Berard), Yvonne Morin (nee Yvonne Bedard).